It’s time to wrap up the highlights of the month through a quick post. 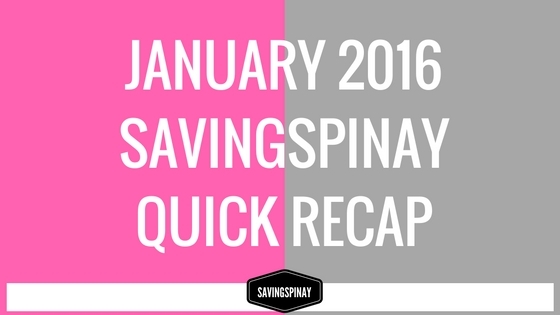 Welcome to SavingsPinay’s January Quick Recap. SERIES | Day 3 Financial Planning 101 : Personal Finance Tips + Free Infographic – New! SERIES | Financial Planning 101 : Day 4 Personal Finance Moves You Ought to be Doing – New! SERIES | Financial Planning 101: Day 1 Top 5 Personal Finance Basics – New! SERIES | Financial Planning 101: Day 2 Elements of a Solid Financial Plan – New! SERIES | Overview of January SavingsPinay Series Financial Planning 101 – New! My new system in tracking my spending and budgeting my money is doing great. It’s nice to finally see how much I spend on items. Actually for the I’ve been extra thrifty this month because whenever I review my spending there were fewer fast food lunch out ever since Nica and I discovered the best jolly jeeps in Ayala (will soon blog about this). I also am not taking pedicap anymore which saved me 16pesos everyday. I am still in the hunt of better ways that I could save money since I have a lot of travel plans for this year. I opened myself again for some easy writing gigs and I am very much fortunate to have the best clients ever. I am happy have extra income through one of my passions. I still have a lot of plans regarding my content writing thing since its something that worked as a source of extra income for me last year. Another great plan for 2016 is to go back hosting events for added income. I miss being an event emcee to weddings, debuts, birthdays and corporate events. I also want to market my hosting skills more and make myself known in the industry.